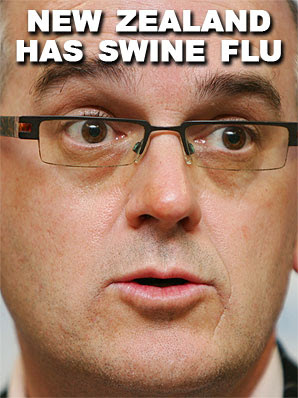 Thousands of New Zealanders may have been exposed to the deadly swine flu virus because of a three-day delay in alerting health boards to potentially infected people. Health Ministry officials confirmed last night that three of the 11 Rangitoto College pupils had contracted the deadly virus after visiting Mexico on a school trip. They were awaiting testing results on another seven pupils, who were assumed to have the virus. Okay, so it’s here, what’s the deal – how bad can a pandemic actually get, well if we look at the pandemic planning the Bird Flu created last time, and based on a 2% kill rate we are looking at 40% infection rate with 33 000 deaths in the space of 8 weeks, normally we deal with 550 deaths a week in NZ, something like this would swamp our ability to deal with the corpses. Within Mexico the kill rate is said to be 7% but what is mystifying everyone is why the rate within Mexico is so much worse than what we are getting at the moment, the virus has either mutated to something much more benign or we aren’t getting what it has mutated into, WHO warn this is mutating rapidly so that could be a curse or a blessing. Much has been made of the fact that this is a ‘media beat up’ now while it is certainly in the interests of the media to terrify and scare you to make money, the reality is that pandemics do happen, they are a biological reality and they can be terribly damaging to a country, not just in the immediate loss of life but it is the suddenness of that loss of life that causes the social unrest. We are overdue for a massive pandemic, one has been building evolutionally since the last major one in 1918, let’s hope this isn’t it as a 7% kill rate is much higher than the one we’ve been planning for of 2%. dont open a new blog so that hopefully noone will answer my questions in the flu blog below-theryre important! So the WHO is now saying only 7 confirmed deaths. And this flu is non-containable. Wonder why NZ and Aust have/are enacting legislation to add this swine flu to the list of diseases that can trigger an epidemic response ranging up to forced isolation and forced detention. "One has been building evolutionally since the last major one in 1918..."
Lol is that so...maybe you should share this new "directed evolution" bombshell with Richard Dawkins. Has Gaia been plotting all this time then??? ?